It is eight in the morning in the plastic surgeon’s office and Hussein is preparing for an operation. He’s going to have a nose job, following in the footsteps of his mother, his brother, his aunt and his cousin who have all had cosmetic surgery. “Now it’s really normal but of course 10 years ago if you were a boy and had a nose job everyone would laugh at you and make fun of you,” admits Hussein. “But now it’s not like that – lots of people are doing it,” he adds. Hussein, who is a university student with a wealthy father involved in trade with China, says he met a woman the other day who asked why a boy needed to worry about his looks so much. “I was shocked because everyone would love to have a more beautiful face,” he says. It’s becoming increasingly common for Iranian men to have cosmetic surgery. At first it was Iranian women who wanted nose jobs because strict Islamic dress regulations meant the only thing peeking out was their face and they wanted to make the best of it. Since the revolution in 1979, Iran has become one of the world’s leading centres for cosmetic surgery with three thousand plastic surgeons operating in Tehran alone. Hussein is taken into the operating room and the surgeon, Dr Magid Navab, installs a suction tube in Hussein’s nose to draw away the blood. At $3,000 an operation, not everyone in Iran can afford a new nose. And it takes some guts if you know how gruesome it’s going to be. Sitting outside the operating room we can hear a “tap, tap” noise of Hussein’s nose being broken and refashioned. “I am a little stressed because it’s my son and not me,” says Hussein’s mother Parinaz. She is meticulously dressed at this early hour of the morning in an elaborate, beaded lace blouse and embroidered chiffon headscarf. “I trust the doctor though because he operated on my nose,” she says. At times Dr Navab closes his eyes to concentrate and feels his way around Hussein’s nose. He has performed so many of these operations – more than 30,000 in his career so far – that he can literally do it with his eyes shut. Compare this number with the Association of Plastic Surgeons in Britain. All their members together did only seven thousand nose jobs last year. Dr Navab says he only does three operations – noses, eyelids and face lifts – and his schedule is completely full the year round. And increasingly his patients are Iranian men. “You don’t see as many men with nose jobs in London or Paris or Germany but today the numbers having cosmetic surgery [in Iran] is amazing,” he says. You might have thought a country ruled by religious precepts would frown on plastic surgery as an unnecessary vanity. Not so. Dr Navab explains that some of his patients are indeed congenitally ugly and need surgery to cope psychologically with their lives and he thinks he has operated on the odd cleric too, though they come to see him in plain clothes. Other patients are more frivolous. “It’s become a fashion – a competition because a boy wants to compete with another over a girl,” Dr Navab says, adding that there are also more and more cases of middle aged men who want to keep up with their young girlfriends. 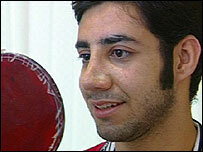 A week after the operation Hussein is preparing to have the bandages on his nose removed. He lives with his parents in an apartment in north Tehran furnished with large gilt-rimmed furniture, plush silk carpets and chandeliers. As we discuss all their operations, the television blasts out Persian pop singers from the Los Angeles satellite channels crooning about how much they love Iran. “I had a hump on my nose and it was removed and then the second operation I had the tip of my nose reduced and my nostrils made smaller,” explains Syed Amir Hashemi, Hussein’s older brother. He also had two operations on his jaw which meant he had to eat through a straw for many weeks after the surgery. Rather coyly they bring out photographs of them from before the surgery and it’s hard to recognise Amir Hashemi or his mother. As veterans of this process, they’ve been preparing Hussein for what to expect when the bandages come off. “I said you can’t play football for at least one year and you can’t go jogging because the new nose needs some time to settle,” says Amir Hashemi. They also know that most patients hate their new noses when the bandages come off and it takes some time to get used to their new looks. Hussein and his mother arrive at the doctor’s surgery bearing flowers as a gift. The bandages are removed, and surprisingly Hussein’s now smaller nose shows no bruising – it’s just a little swollen. A little hand held vanity mirror is produced for Hussein to peer into. “It’s all very good”, he keeps saying, smiling at the reflection of his new nose.